List Building Just Got A Whole Lot Easier! If you've been struggling to build an opt-in list in the lucrative "make money online" niche because the 'techy' stuff is holding you back, I've got great news! I'm going to instantly eliminate those 'profit robbing' obstacles from your path so you can quickly and easily start building your own money-getting opt-in list ASAP! Complete 'Plug N Play' System.. I'm handing you my complete 4 step subscriber-pumping 'squeeze page' affiliate marketing funnel.. pre-made with multiple built-in money generators to help you get paid while you build your list! You're going to receive a "done for you" Squeeze Page, Confirm Page, Thank You Page, and Download Page. Here's an overview of the entire opt-in system and what your subscriber sees from start to finish..
Get paid 50% to 100% commissions! Each step of the opt-in process exposes your subscriber to affiliate related resources that pay you.. including a "per per lead" offer, a free offer leading to continuity, and a special hard-to-resist "new subscriber" video CD offer! In a hurry? Here's a breakdown of the profit centers..
Brandable report to give away to build your list. Brand with your name and your affiliate links to 4 products (for Clickbank and PayPal commissions)! One pays you per lead! The other pays you recurring commissions! Special 'New Subscriber' offer for a physical video CD (7 Ways To Fast Cash) offering a SECRET discount and Bonus Free DVD! You get paid $25 flat PayPal commission per sale. List Marketing Formula - one affiliate link gives you 3 chances to make a commission!! Getting Up and Running Is "Easy Peezy"..
Getting your instant list-building profit system up and running is super easy with the (included) step by step video tutorial! Just look over my shoulder as I show you how to add your email capture form, edit your affiliate links and upload everything to your web host. You'll be ready to start collecting subscribers and generating passive automated affiliate commissions today! "So What Makes Your System Different?" template with NO ready-made report, NO sales copy, NO download page, NO built-in profit system, and NO instructions for putting it together! You're left out in the cold to do the other 95% of the work and fill in the rest of the funnel. Still other high-end list building training programs will tell you how to build your list marketing funnel as long as you fork over $197.. Ouch!! X - Write an enticing lead-generation report, to attract subscribers, and covert it to PDF format! X - Design a high-converting opt-in "squeeze" page! X - Write the sales copy for the squeeze page! X - Create and write the correct verbage for the "Thank You" and "Confirmation Pages"! X - Pay for a graphic designer to create an eCover image (added expense)! X - Find affiliate products to monetize your system! X - Find and add affiliate banners to your pages! X - Figure out how to put the pieces together!! With my ready-made package, ALL of the above is done FOR you. How would you like to resell "Instant List Profit System" and keep 100% of the profits? With your order today, you'll get transferrable Master Resell Rights allowing you to instantly secure your own money-getting "business in a box"! With master rights, YOUR customers will be eager to buy resell rights from YOU so they can enjoy the same benefits! A replica of this Website (including salesletter and graphics)! Ready-made Affiliate Page pre-loaded with promotional tools!! and your Reseller License, a $47 value, at no additional charge! When you order today, I'll throw in the following fast action bonus..
How To Get Your Very First Subscriber In The Next 24 Hours. 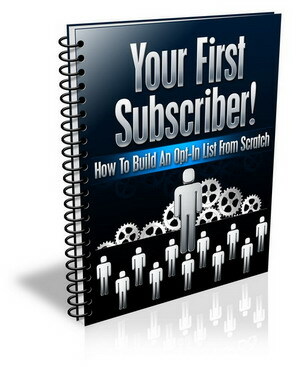 Little Known But Powerful Strategy That Will Explode Your List Size Into The Thousands In Just Weeks for FREE! Where to advertise your lead generation page on high traffic websites for as little as $10! This bonus may be pulled at anytime without warning. So to ensure you receive this valuable bonus (a $17 value), you must order now! 9 built-in affiliate profit centers! Commissions from 50% to 100%! Custom ready-made 468x60 banner ads promoting your squeeze page! Video tutorial showing how to put it all together! You get all of this for a one time payment of only $47 $27 $9.24! 24 hours from today, you can be nothing more than 24 hours older or you can be on your way to finally building your own money-getting opt-in list ASAP. You decide! Save time, save money, and save the headaches of trying to do it all yourself! Invest in the "Instant List Profit System" today and enjoy your instant shortcut to online profits.. YES! I want to fast-track my success online and take full advantage of this done for me opportunity to start building my list (and get paid in the process) ASAP! I'm ready to take action now..
To building your list NOW! P.S. If you are NOT planning to invest in my Instant List Profit System, then please ask yourself this question -- "How will I learn what I need to know to create my own list building profit system'" If you can't answer that, you must order now! P.P.S. How much more time and money will you waste trying to figure it all out yourself? Opportunity is knocking. The time to act is now!